For over two decades, Dillman's classic text on survey design has aided both students and professionals in effectively planning and conducting mail, telephone, and, more recently, Internet surveys. The new edition is thoroughly updated and revised, and covers all aspects of survey research. 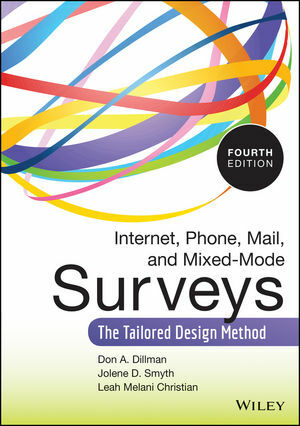 It features expanded coverage of mobile phones, tablets, and the use of do-it-yourself surveys, and Dillman's unique Tailored Design Method is also thoroughly explained. This invaluable resource is crucial for any researcher seeking to increase response rates and obtain high-quality feedback from survey questions. Consistent with current emphasis on the visual and aural, the new edition is complemented by copious examples within the text and accompanying website. Use of capabilities provided by newly mass-used media: interactivity, presentation of aural and visual stimuli. Grounded in the best research, the book offers practical how-to guidelines and detailed examples for practitioners and students alike. Don A. Dillman, PHD, is Regents’ Professor in the Department of Sociology and the Social and Economic Sciences Research Center at Washington State University. He received the Roger Herriot Award for Innovation in Federal Statistics from the American Statistical Association and the Washington Statistical Society in 2000. Jolene D. Smyth, PHD, is an associate professor in the Survey Research and Methodology Program and the Department of Sociology and is the Director of the Bureau of Social Research at the University of Nebraska-Lincoln. Leah Melani Christian, PHD, is a Director in Research Methods at Nielsen where her work focuses on panel recruitment and maintenance.